Nashville, TN (July 8, 2013) Renovo Amp Works is pulling out all the stops for Summer NAMM 2013 in Nashville. Walsh Guitars custom handmade electric guitars will be on hand as a perfect complement to Renovo’s boutique amplifiers. In addition, they will be showing off their Stompblox modular pedal boards. New to the lineup is the Stompblox PR module. What makes the PR module unique is that it supplies power to effect pedals and input/output or loop switching. The power supply section provides eight isolated 9V or 12V outputs (switchable), with two outputs optimized for digital and high current effects, one switchable to 18V and one output with a sag control to emulate a dead or dying battery. 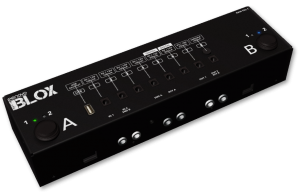 In addition, a bonus 9th output provides USB power for controllers or mobile devices that are integrated into effects rigs. The Stompblox PR stands out from the pack by adding two high quality switches, allowing the user to chose one of three switching modes. One mode allows independent switching between two inputs and two outputs, allowing switching between acoustic and electric guitars on the input side and an amplifier or direct box on the output side. Another mode switches between two effect loops (or both in serial) allowing instant control of your pedal board. The third mode allows an instant switch between two loops with one button press, perfect for changing from a rhythm loop to a lead loop. The Stompblox modular pedal boards and Stompblox PR module are slated for a Fall 2013 release. For more information, visit www.renovoampworks.com, www.walshguitars.com, or visit Renovo Amp Works at booth 1118 at Summer NAMM in Nashville.